The claims confirmed initial blame placed on the separatist group by Indonesian authorities, and marked a deadly escalation of conflict in the restive region unseen in recent years. Indonesian media reported on Tuesday that around 150 Indonesian armed forces were in pursuit of the gunmen, after President Joko Widodo ordered military and police chiefs to check in on the situation. Witness reports described to RNZ Pacific by officials painted a grim picture of a civilian massacre which took place atop a hilltop in Tolikara regency on Sunday. On Saturday, as members of the Liberation Army held a ceremony in neighbouring Nduga to commemorate Papua’s independence from Dutch colonial rule on December 1st, 1961, a construction worker nearby snapped a photo of the scene. The employees of the state-owned company Istaka Karya were building bridges and roads in Papua, where Jakarta has been undertaking an infrastructure drive. But the Liberation Army, which claimed responsibility for the attack on Tuesday, described the workers as armed members of Indonesia’s military, or TNI, disguised as civilians. The presence of a camera prompted a violent reaction from the group of around 50 Liberation Army fighters, who rounded up dozens of workers, bound their hands and marched them North, to Lanny Jaya regency, said TNI spokesperson Mohammed Aidi. On Sunday morning, the workers were taken to the top of a hill and forced to march in formation, while they were shot at by Liberation Army soldiers, who killed at least 19 people. Eleven employees managed to survive the massacre by pretending they were dead, said Mr Aidi. But when they ran, the group was pursued by the Liberation Army and 5 more were killed with bow and arrows and spears. Survivors took refuge at a TNI outpost, where soldiers returned fire at the Liberation Army. One soldier died in the shootout. Four workers were evacuated by police and military on Tuesday, along with eight local health centre staff and teachers employed by TNI, said Mr Aidi. Three workers have been hospitalised with gunshot wounds, while another two who escaped remained missing. President Widodo said on Tuesday he would visit Papua once more information on the incident became available. “We realize that even though the development in Papua is indeed very difficult to carry out and can still be hindered by incidents such as the reported one, the development in Papua should continue,” he said. In February, the Liberation Army made a fresh declaration of war against the TNI, which it called “the invaders”. 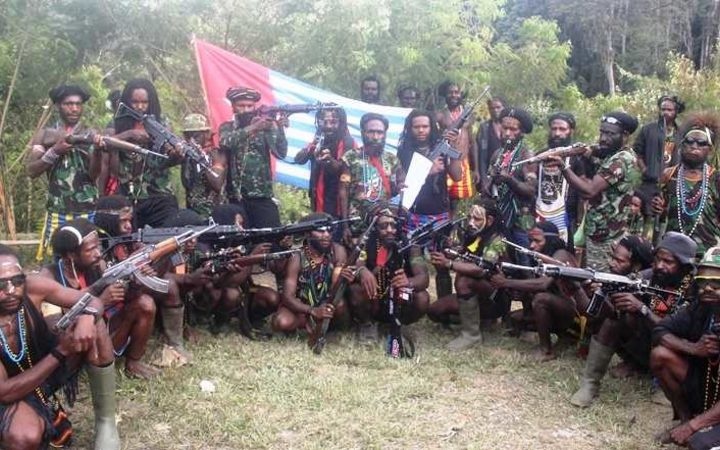 Since then, the group has been involved in a spate of skirmishes in Papua, including a series of deadly gunfire exchanges in the Highlands regencies of Puncak Jaya, Nduga, Timika and Lanny Jaya. Two Liberation Army members were killed by TNI in November when they exchanged gunfire in Lanny Jaya. Five others were killed in Puncak Jaya in October by the Indonesian military, it said. In late October, Indonesian media reported that a group of 15 school teachers and medical workers were held hostages by the Liberation Army in Nduga for two weeks, and that one teacher was raped.